Disconnect the intermediate steering shaft from the steering gear. Refer to Steering Column Replacement. Disconnect the steering column dash seal from the dash panel. Disconnect the outer tie rods from the steering knuckles. 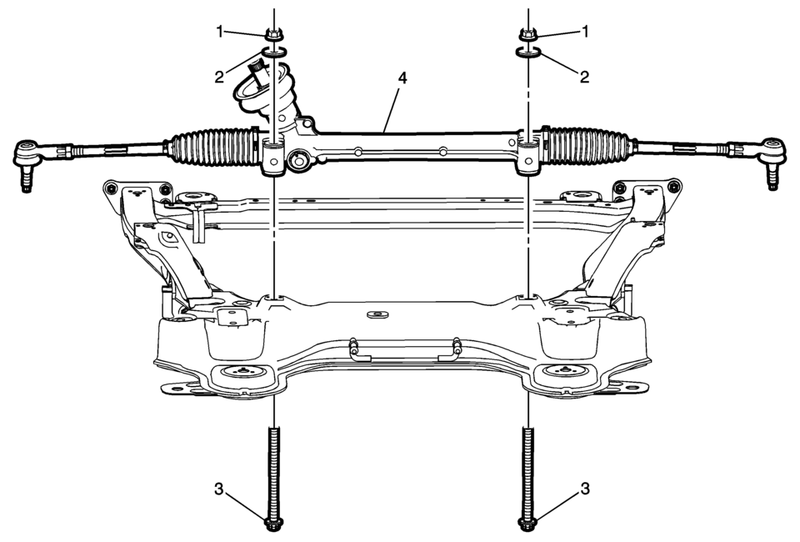 Refer to Steering Linkage Outer Tie Rod Replacement. Partially lower the rear of the drivetrain and front suspension frame in order to gain clearance for the steering gear. Refer to Drivetrain and Front Suspension Frame Replacement. During installation, hold the steering gear nuts while tightening the steering gear bolts. This component is equipped with torque-to-yield fasteners. Install a NEW torque-to-yield fastener when installing this component. Failure to replace the torque-to-yield fastener could cause bodily injury and damage to the vehicle or component. Remove the 2 steering gear bolts. Install 2 NEW steering gear bolts. Hold the steering gear nuts while tightening the steering gear bolts. Use the EN-45059 meter in order to tighten the steering gear bolts to the specification. Carefully remove the steering gear through the left front wheel opening.